Monday evening last week I was busying myself in the feed shed mixing Max’s tea, when I heard it. Could it be, I thought? Straining my ears, I stopped what I was doing. There it was again. My heart soared. They’re back, I thought. Then I heard it again… the unmistakable chattering of swallows. My swallows, back from Africa to spend the summer with me. I went out into the yard and there they were, a pair of them swooping and soaring, chattering away. What joy, I was thrilled. They have staked their claim on the stable next door to Max’s. The more dangerous one, I feel, where marauding cats are concerned, as the nest is on the gable end right in front of the door. Whereas Max’s door is on the left of the stable, the opposite end to the nest up in the pitch of the roof. How lovely, now my family is complete! Thursday was my last day working for Orchard Toys, after 5 years plus. It was also the last day of my working life. I am now a retired person! Wow, my life is now my own. It still hasn’t really sunk in. Will now have time to ride Max, garden, grow my veggies, take photos and sort everything out. Whether I’ll have the energy is another thing! At 11 am on the Thursday everybody was ushered into the canteen for my presentation. My boss said some really lovely things about me and I mumbled a thank you, not having prepared anything to say. Silly me. I was gob smacked when I opened my leaving gift… It’s a Nikon SLR digi camera. I was, and am, absolutely thrilled. How kind of everybody! I will now have the time to leisurely snap away and maybe drive off somewhere to get some shots. Hitherto, because of time constraints, I have had to take photos around the cottage or up at the field. Now, the world is my oyster! Can’t wait. Another surprise was my card. 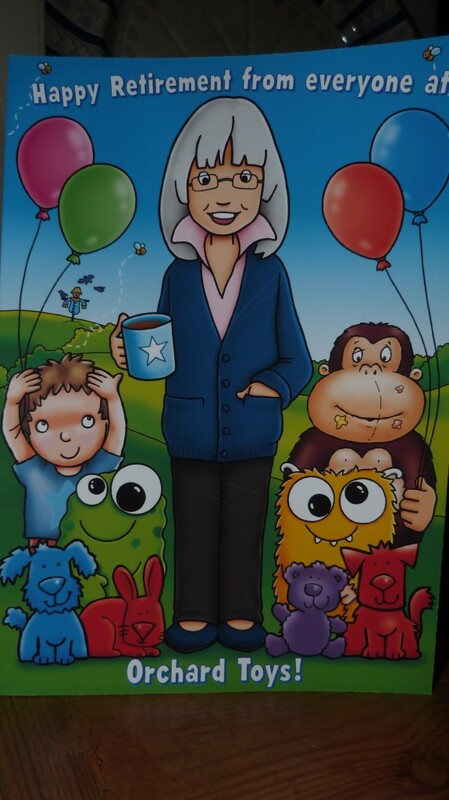 Especially designed by Nicki one of the company’s illustrators, which shows me in my favourite cardi holding my mug. Apparently she has captured my stance perfectly. I had no idea I stood with one hand in my pocket! What a lovely keepsake to remember my happy days at Orchard Toys! Another event that made this a very positive week, happened on Friday night. I was sitting eating my dinner. It must have been about 8 pm and it was dusk outside. I heard one of the cats trying to get through the catflap. It kept going ‘click’ but the cat didn’t come through. (It’s one of those that is operated by the cat’s microchip. So every time they get close to it, it goes ‘clunk’ and it opens.) I went to investigate and it was Maisie, with a baby bird, or a small bird, anyway. I managed to scoop it up as it wasn’t flapping around, unlike the bird she brought in the other month. It looked like a dunnock. I put it on the tray on the bird feeder. Maisie followed me out there so I picked her up and shut her in the bathroom. I kept watching the bird feeder until it got dark. The bird remained there. I really thought that I would find it still there in the morning, dead. The forecast for that night was for frost. This morning I went to check and it had gone. So I hope that it flew off. I haven’t seen a sparrow hawk in the garden for several years, so I’m confidant that it is still alive. Hurrah! Then today when I was digging bean and potato trenches on the veggie plot, I saw a peacock butterfly, the first I’ve seen this year! Hurrah again! This entry was posted in Self, Swallows, Veg patch by Country lover. Bookmark the permalink. 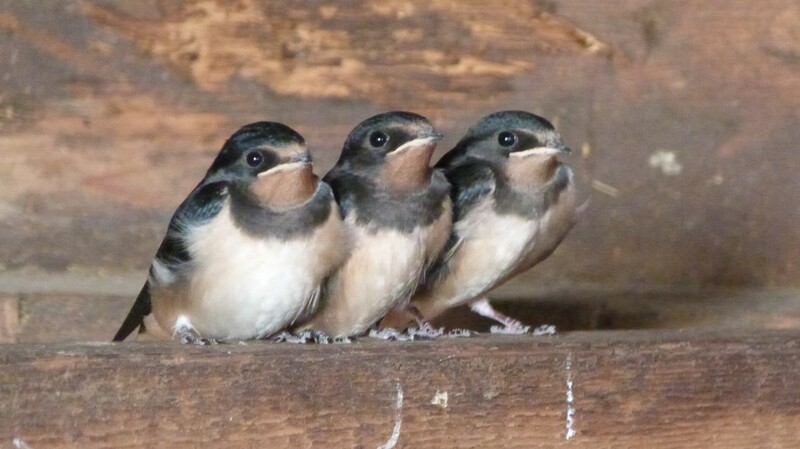 What a wonderful week Linda, I love the story of the swallows, I spotted some this week too. Enjoy your retirement, I look forward to reading all your adventures. Thanks very much for dropping by. Yes, am freeeeee! It’s wonderful. Hasn’t really dawned on me yet. Don’t have to go to work tomorrow. Yippee! That is a great gift and fantastic that you can now get out and about snapping – love the retirement card too.Greedy Gorilla is one of my boys fav games. Thanks so much Louise for your visit. Yes, a great gift and lovely card! Very memorable! Hello again Rebecca and thanks for your second comment! I am being spoilt! Glad you liked my swallow story, it really was a very special experience. So strange how I bonded with those little bald bird for those three days I was looking after them! Yes, I am really looking forward to my retirement, but it really hasn’t quite sunk in yet!